South Africa Overturns Diplomatic Immunity For Grace Mugabe A South African court has overturned a government decision to grant immunity to the former first lady of Zimbabwe over her alleged assault of a South African model with an extension cord. 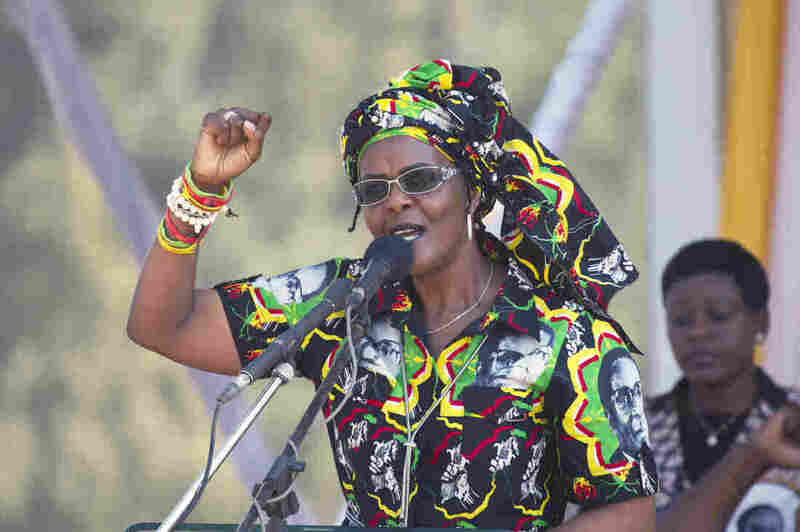 A South African court has overturned diplomatic immunity for former Zimbabwean first lady Grace Mugabe, shown here at a 2017 rally. Last August, Grace Mugabe was allowed to return to Harare after former minister of international relations and cooperation Maite Nkoana-Mashabane granted her immunity. "That the minister has the power to confer immunity on Dr Mugabe is neither doubtful or debatable," the judge said, according to News 24. "She, however, has to exercise this power in a manner that is constitutional and lawful." Willie Spies, a lawyer for model Gabriella Engels, said "this decision paves the way for the institution of criminal prosecution steps against Ms. Mugabe." The alleged altercation with Engels happened at a Johannesburg hotel, as we've reported. Her sons were allegedly in a room nearby. As Reuters reported, Mugabe says she did not assault Engels. She claims Engels was "intoxicated and unhinged," and lunged at her with a knife, according to the wire service. Mugabe disappeared after the alleged assault, and South Africa put a "red alert" for her on its borders. Shortly after, she was granted immunity. That was puzzling at the time, as NPR's Peter Granitz reported, because officials had said that "since she's not a head of state, diplomat or cabinet official, she would not be covered by diplomatic immunity." "Hong Kong's Department of Justice granted Mugabe immunity in 2009 after she was accused of repeatedly punching a British photographer who tried to take photos of her." Since the incident in South Africa, the domestic political situation in Zimbabwe has changed dramatically. Robert Mugabe, who ruled for nearly 40 years, stepped down in November under military pressure. As NPR's Eyder Peralta reports, there's an election happening in Zimbabwe today. And it's "the first time he is not on the ballot since Zimbabwe's independence in 1980."